Swami NadaBrahmananda is currently Austin, Texas. Beginning now, here is an extract from the book "I AM THAT" by Sri Nisargadatta Maharaj. We will endeavor to regularly offer here for our readers to enjoy different extracts from this book for our reader's enlightenment. In the opinion of this writer, it is the most important spiritual book in the world at this time, in as much as it directly helps the reader to understand their spiritual path and its successful conclusion. Those wishing so, may purchase the book from amazon.com, a reliable source of books at a good price. Each seeker accepts or invents a method which suits him, applies it to himself with some earnestness and effort, obtains results according to his temperament and expectations, casts them into the mould of words, builds them into a system, establishes a tradition and begins to admit others into his “School of Yoga”. It is all built on memory and imagination. No such school is valueless nor indispensable. In each, one can progress up to the point when all desire for progress must be abandoned to make further progress possible. Then all schools are given up; all effort ceases; in solitude and darkness the last step is made, which ends ignorance and fear for ever. The true teacher, however, will not imprison his disciple in a prescribed set of ideas, feelings and actions. On the contrary, he will show him patiently the need to be free from all ideas and set patterns of behaviour, to be vigilant and earnest and go with life wherever it takes him; not to enjoy or suffer, but to understand and learn. Under the right teacher, the disciple learns to learn, not to remember and obey. Satsang, the company of the noble, does not mould, it liberates. Beware of all that makes you dependant! Most of the so-called “Surrenders to the Guru” end in disappointment, if not in tragedy. Fortunately, an earnest seeker will disentangle himself in time, the wiser for the experience. Surely self-surrender has its value? Self-surrender is the surrender of all self-concern. It cannot be ‘done’. It happens when you realize your true nature. Verbal self-surrender, even when accompanied by feeling, is of little value and breaks down under stress. At the best, it shows an aspiration, not an actual fact. Just see the person you imagine yourself to be, as a part of the world you perceive within your mind and look at the mind from the outside, for you are not the mind. After all, your only problem is the eager self-identification with whatever you perceive. Give up this habit. Remember that you are not what you perceive: Use your power of alert aloofness. See yourself in all that lives and your behaviour will express your vision. Once you realize that there is nothing is this world which you can call your own, you look at it from the outside as you look at a play on the stage , or a picture on the screen, admiring and enjoying, but really unmoved. As long as you imagine yourself to be something tangible and solid, a thing among things, actually existing in time and space, short-lived and vulnerable, naturally you will be anxious to survive and increase. But when you know yourself as beyond space and time – in contact with them only at the point of here and now, otherwise all-pervading and all-containing, unapproachable and unassailable, invulnerable – you will be afraid no longer. Know yourself as you are – against fear there is no other remedy. You have to learn to think and feel on these lines or you will remain indefinitely on the personal level of desire and fear, gaining and losing, growing and decaying. A personal problem cannot be solved on its own level. The very desire to live is the messenger of death, as the longing to be happy is the outline of sorrow. The world is an ocean of pain and fear, of anxiety and despair. Pleasures are like the fishes, few and swift, rarely come, quickly gone. A man of low intelligence believes, against all evidence, that he is an exception and that the world owes him happiness. But the world cannot give what it does not have; unreal to the core, it is of no use for real happiness. It cannot be otherwise. We seek the real because we are unhappy with the unreal. Happiness is our real nature and we shall never rest until we find it. But rarely do we know where to seek it. Once you have understood that the world is but a mistaken view of reality and is not what it appears to be, you are free of its obsessions. Only what is compatible with your real being can make you happy and the world, as you perceive it, is its outright denial. Keep very quiet and watch what comes to the surface of the mind. Reject the known, welcome the so far unknown and reject it in its turn. Thus you come to a state in which there is no knowledge, only being, in which, being itself is knowledge. To know by being is direct knowledge. It is based on the identity of the seer and the seen. Indirect knowledge is based on sensation and memory, on proximity of the perceiver and his percept, confined with the contrast between the two: The same with happiness. Usually you have to be sad to know gladness and glad to know sadness. TRUE HAPPINESS IS UNCAUSED AND THIS CANNOT DISAPPEAR FOR LACK OF STIMULATION. It is not the opposite of sorrow. It includes all sorrow and suffering. Pleasure depends on things; happiness does not. Locasa masta sukhina bhavatu. (May the whole world find happiness). Qtn: "What is SIN?" Ans: "All that binds you" -- Sri Nisargadatta. The IMS is dedicated to promoting World Peace through Meditation, which can be read from our logo. 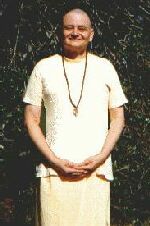 Our founder, Swami NadaBrahmananda, a Yoga and Meditation teacher since 1974, has been conducting special Weekly Healing groups for 25 years, using advanced psychic and spiritual techniques to send healing vibrations and spiritual love to those who are ill and then to the whole world in general. The evenings conclude with personal meditation. The IMS is encouraging those who would like to form their own private groups, meeting in private homes etc. to make a difference in the world through meditation and to contact us for details and techniques. The idea is to form a loosely connected network around the world of people, all doing this very effective visualization. Swamiji has departed on an extended pilgrimage to further this goal. This organisation is informally connected to the world wide Divine Life Society, based in Rishikesh India, founded by the great spiritual master, H.H. Swami Sivananda Saraswati, who established his Ashram and headquarters in Rishikesh, U.P. in the foothills of the himalaya mountains north of the capital, Delhi. Swami NadaBrahmananda, our founder, sees Swami Sivananda (pronounced Shivananda) as his guru since 1975 after having 2 dreams of him. 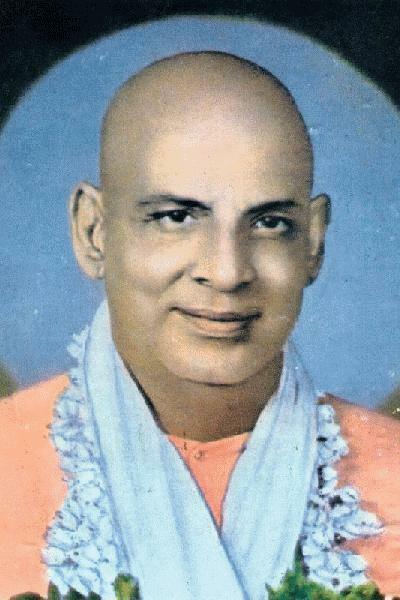 (Swami Sivananda left his body in 1963). However, teachings from other spiritual disciplines such as Tibetan Mahayana Buddhism, certain western mystical traditions and others are offered here to students, where appropriate. The effect of many minds joined together, working for world peace and harmony can indeed usher in the often predicted "Golden Age". We also are interested in helping people, who are perhaps outside big cities or in some way don't have easy access to advice and teachings on spiritual and meditation techniques etc. To the latter, we invite your questions through our WEB page link below. The service is free, although, of course donations are always welcome. We have a long term project of establishing a retreat center on a nearby beautiful island, where anyone, from any discipline or background, may do intensive meditation retreats, with an eye to obtaining some degree of enlightenment or "Realization of the Self". All our regular spiritual activities, including Yoga classes are free of charge, as is the tradition in the far East. However, Yoga classes, all day workshops (see the schedule, click above) and private regression therapy carry suggested donation notices, to help with our expenses. If you know someone who is ill and whose name you would like us to add to our healing list, each Wednesday evening, please let us know and we will be happy to do so. This is of course a free service, although again donations are welcome! Although we cannot guarantee that a person will be healed, since that is often a matter of Karma, the energy sent to the person does definitely at least reduce the suffering. Please see the attached pages for details. Why not subscribe to our regular mailing list and we'll send you articles on spiritual subjects; most are published on these pages. Just e-mail us below with your request. In our Ashram we have yoga classes lasting about 2 hours. A Pranayama (Yogic breathing) and meditation class, followed by an Asana (postures) class are available weekly. Please e-mail for details. Hatha, Raja and Kundalini Yoga. How to see the Human Aura. Understanding your dreams from the spiritual point of view. Discovering Your Own Past Lives (through hypnotic regressions and also meditation on your own). Out of Body Travel (for advanced regular students only). A one day Intensive Yoga and Meditation retreat for all, held each month. Fasting clinics - To lose weight or something else? Shamata & Vipassana Meditation, Prayers for World Peace. Power of Prayer and Love. and others are in the works! This Web-Page has been accessed 120266 times.